…..they were the flower that my bridesmaids carried in their bouquets. …..came to my door with a bouquet of daisies. …..I headed to my local grocery store to get my “happy flowers”…. 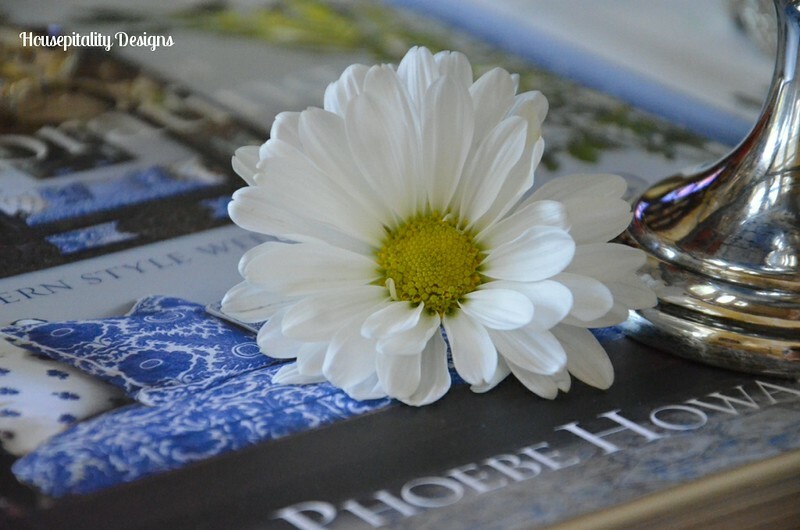 Daisies and Phoebe Howard go so well together, because they make me happy! 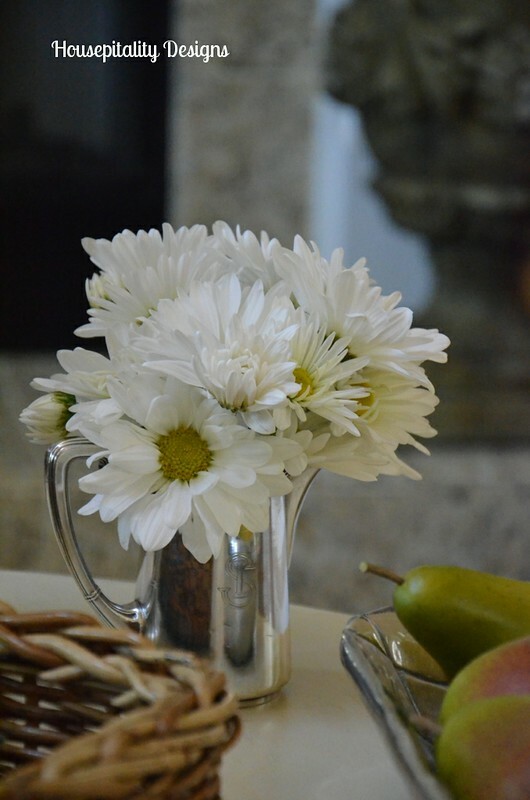 And the daisies found their way into the dining room…. She does this all the time…I find things added and “rearranged” by her…I love it! So from me and my ever so cute “creative director”…we wish you a most wonderful weekend! Daisies are the happy flower, and I think your granddaughter made the display even happier with a touch of whimsical. Lovely. Another thing we have in common…I love daisies, too. A very pretty vignette, as usual and I love Graylynn’s added touch. Have fun at Haven. Lovely post, Shirley! I’m looking forward to seeing you at Haven! Your wonderful silver pieces and those daisies make the perfect summer combination. 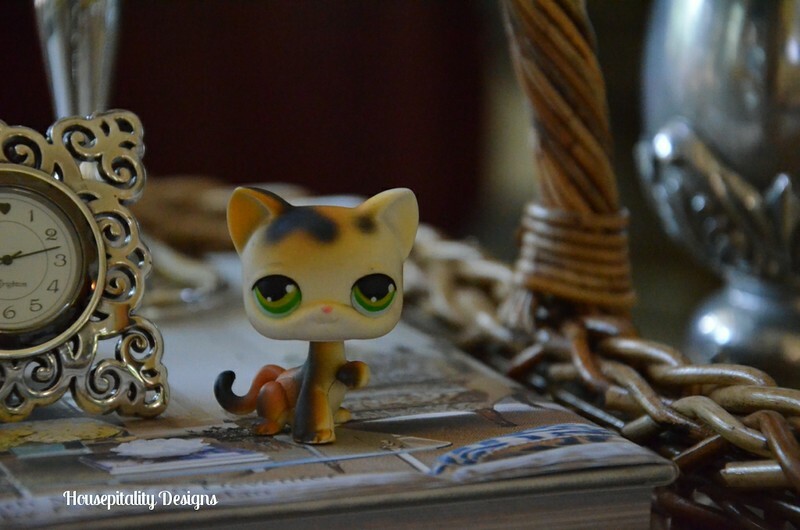 and a kitty addition will help any vignette!! 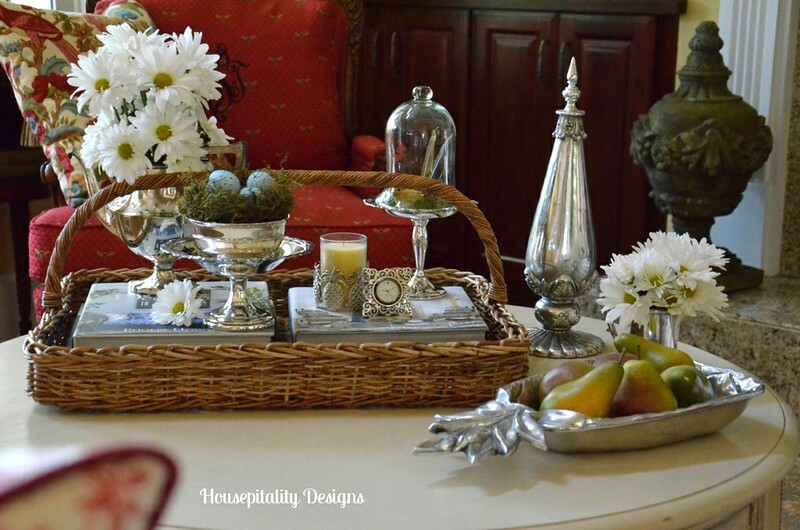 Debra@CommonGround’s recent post…Be Inspired #151: Kitchen Remodel with Vintage in Mind. 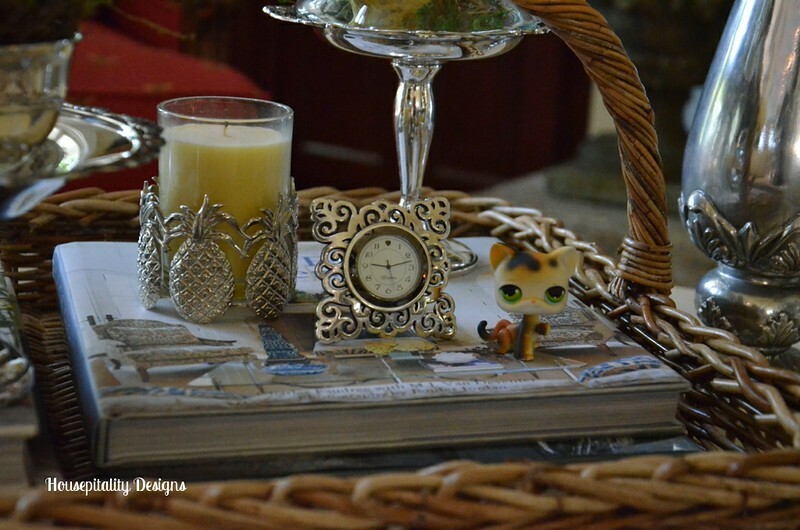 This is a gorgeous vignette, Shirley! I know by now you are enjoying Haven! I’m looking forward to your posts and photos. Hi Shirley! What a beautiful post! I love your pretty little daisies and what lovely place you’ve placed them! Beautiful snaps too! So pretty. 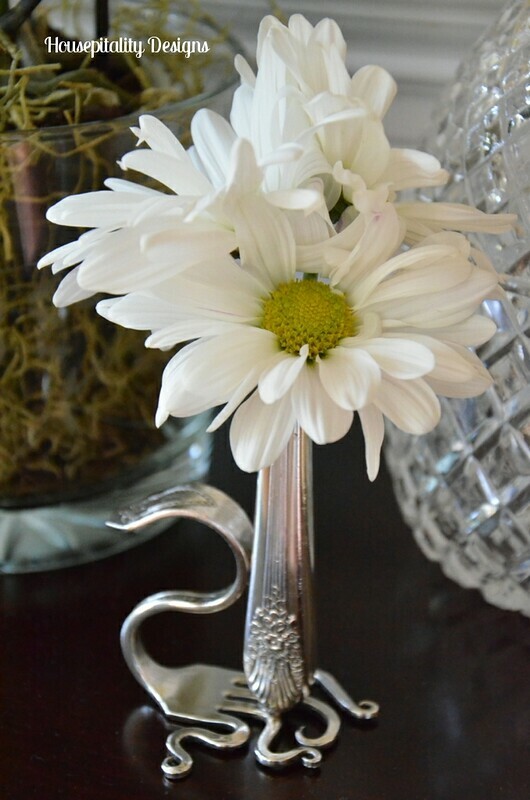 I love the simple white daisies with the silver. Love your little creative director’s touches. So cute! See you in a few hours. Look forward to seeing you, Shirley! Shirley, your whole vignette looks so ‘happy’! And what a sweet little touch from your granddaughter! 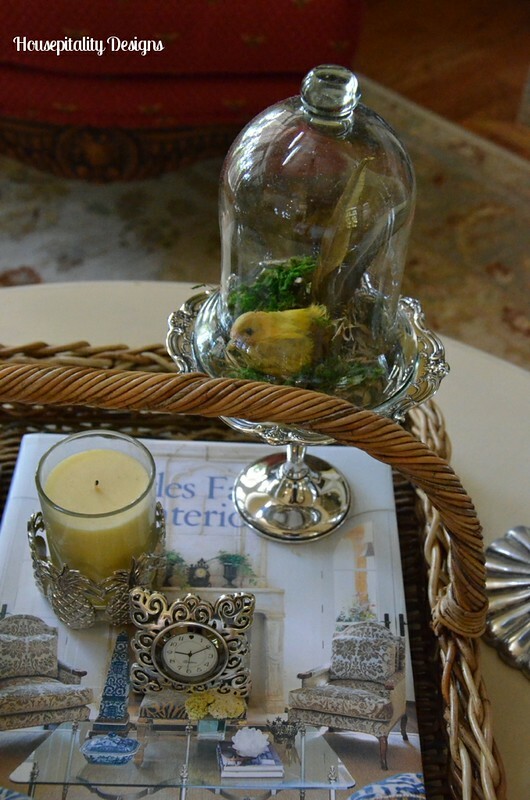 Gorgeous vignette Shirley…I love all your pretty silver pieces! 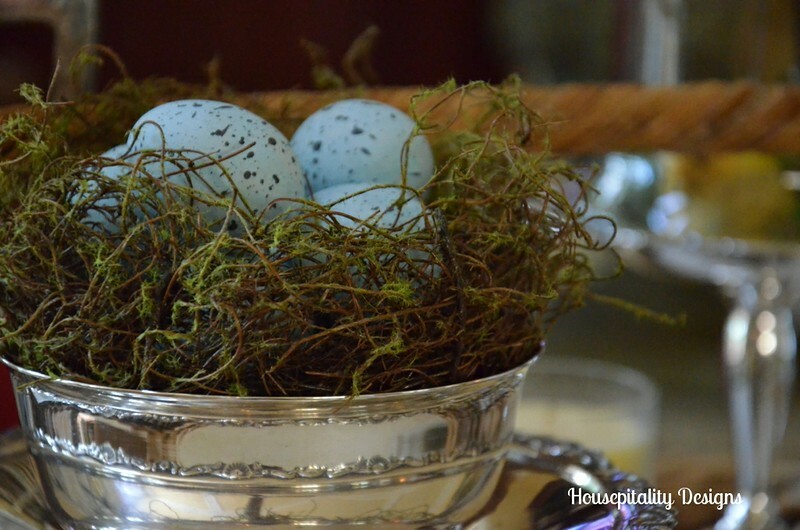 Angela’s recent post…For the Love of Silver Plate! So precious to have a little helper. She definitely has a good touch. The vignette is so beautiful and your photos…perfection. 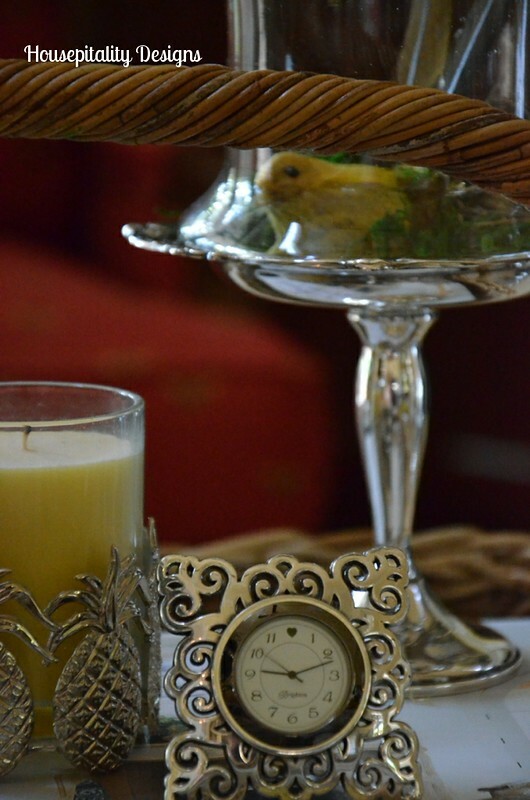 Savannah Granny’s recent post…Favorite Thrift Finds! Your vignettes always look so beautiful! I love your granddaughter’s sweet touch. Too cute! 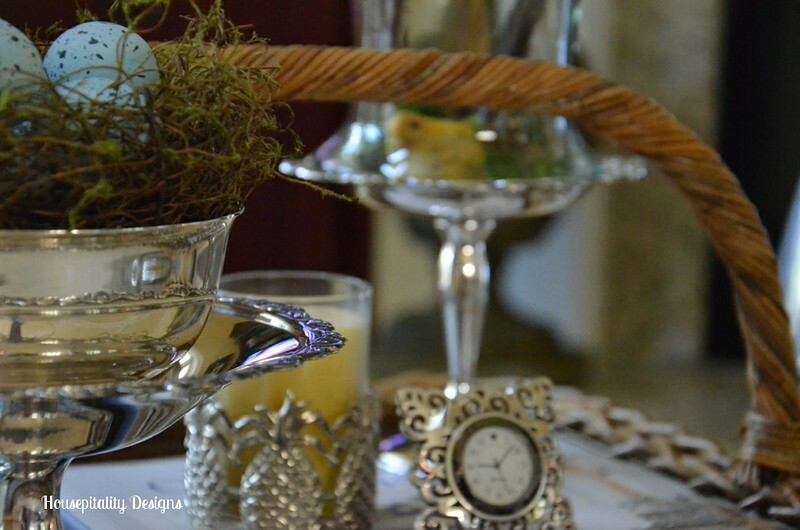 Shirley I always adore your beautiful vignettes! 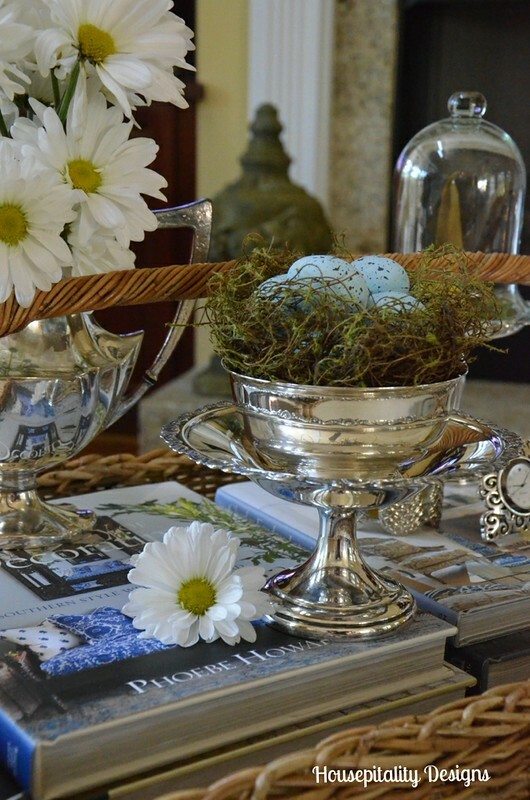 The silver, designer books,and daisies are lovely! Shirley, what a beautiful post. 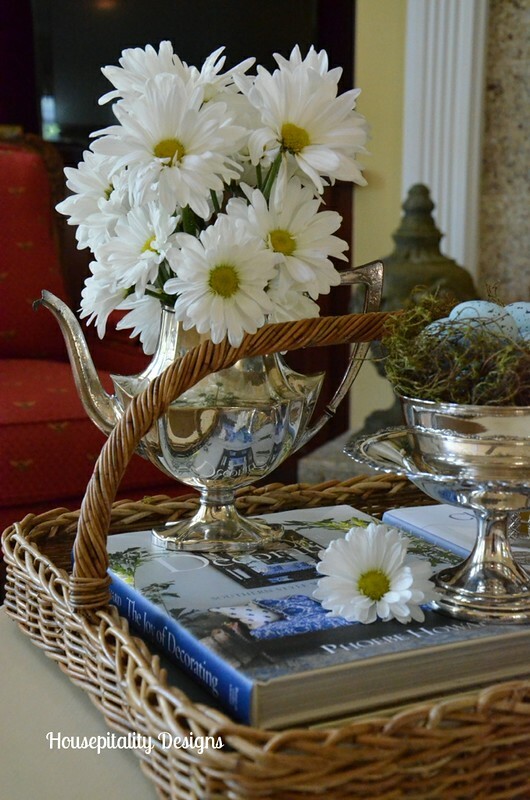 Love daisies and love them with all that beautiful silver. That cloche is adorable too! Hope you are having a great time at Haven!!! I love Gerber daisies they are one of my favorites! I also wanted to say we were so happy to finally meet you in person. We already can’t wait till Haven next year. Oh and thank you so much for convincing us to stay for the ending. It paid off! Have a great week! I love your daisies and your pineapple candleholder too! We had so much fun meeting you this week-end. You have been such a loyal reader, and we really appreciate it! Daisies are such sweet flowers. I love You’ve Got Mail too! Your arrangements are very pretty. Dropping by from Met Monday. I love your vignette, Shirley! The silver accents are gorgeous and the happy flowers are a beautiful touch! Your “creative director” rocks! So glad I got to see and spend time with you at Haven … such FUN!! Not only did my bridesmaids carry daisies – I did as well. I have some shastas from my garden in a vase on the dining room table as I write this. They are my very favorite flower. Such a pretty vignette Shirley. 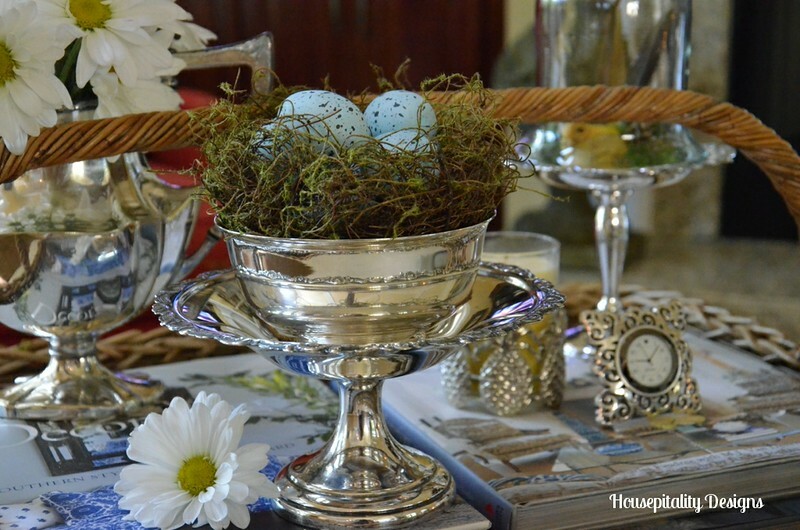 It makes me want to polish my silver and add some daisies to my kitchen table. Grandchildren are the best, aren’t they? The little touches of character they add always make you come away with a smile. The latest in our home is little bandaids lovingly placed here and there. Perhaps one day she will become a nurse. Cute touch from the “creative director”. Your summer vignette is absolutely lovely in every detail. This inspires me to pull out some silver, go buy some daisies, and make one of my own. Thanks! Beautiful photos! 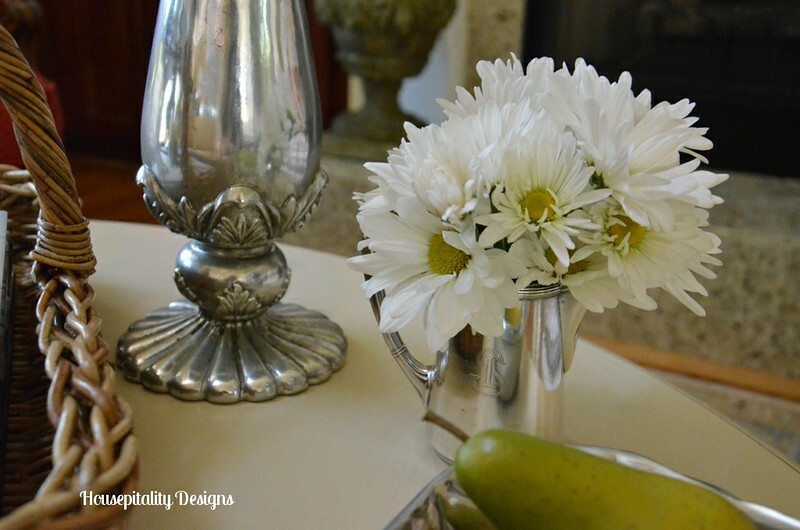 I love the combination of the daisies with the silver. Just lovely!